We planned an October date to dayhike these peaks, in part, to avoid the heat, but also to lessen the possibility of high water in the Subway on our way to South Guardian Angel. 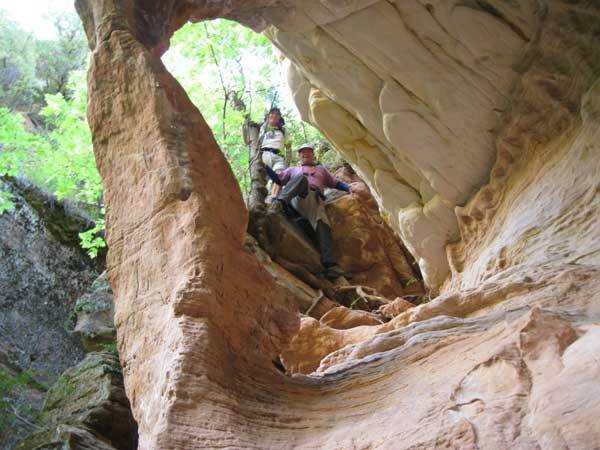 The Subway is one of two deep, narrow canyons in Zion that are popular hiking destinations. 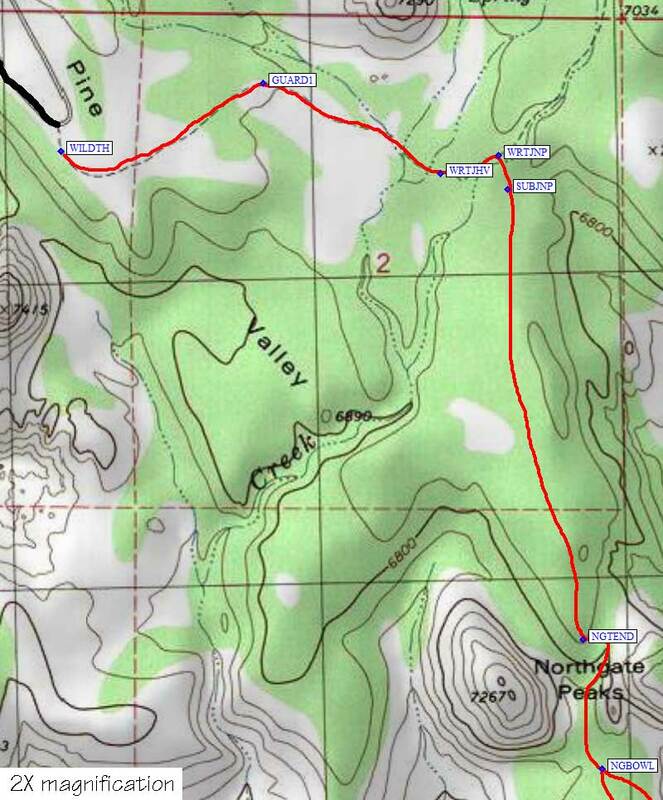 In the past, the described Desert Peak Section route for SGA began at the lower end of the Subway and traveled a considerable distance up the narrow canyon before exiting up to SGA. It was listed as a two-day trip. However, the Subway has been closed to overnight camping for over 10 years. 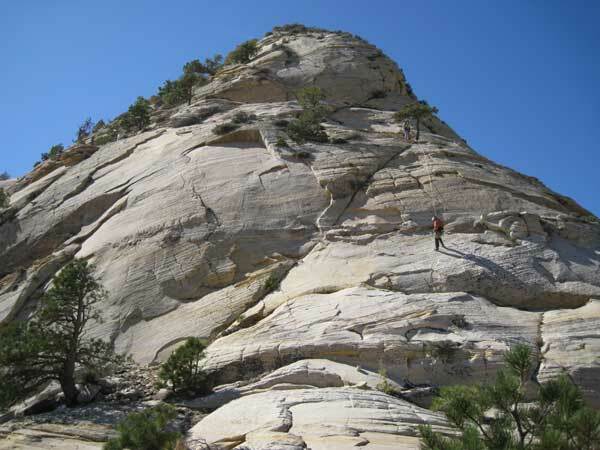 Nowadays, most SGA climbers begin their hike at Wildcat Canyon trailhead and complete the climb as a dayhike, barring serious route-finding problems. Jump to South or North Guardian Angel writeups, or to maps and waypoints. The Wildcat Canyon trailhead was used for climbs of both Guardian Angels. Nearest camping is at Lava Point, about 5 miles further up the road from the trailhead. 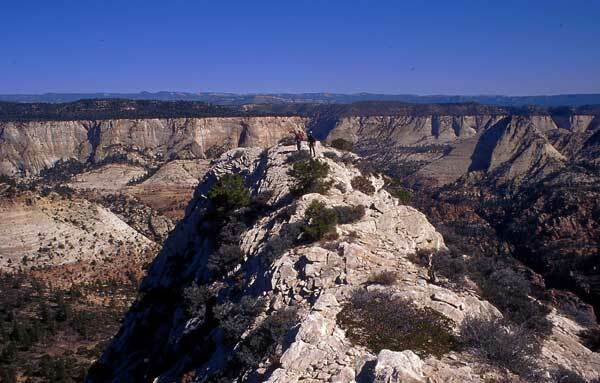 This small campground sits high on a mesa in a small stand of trees. It can get quite cold and windy here in the fall. 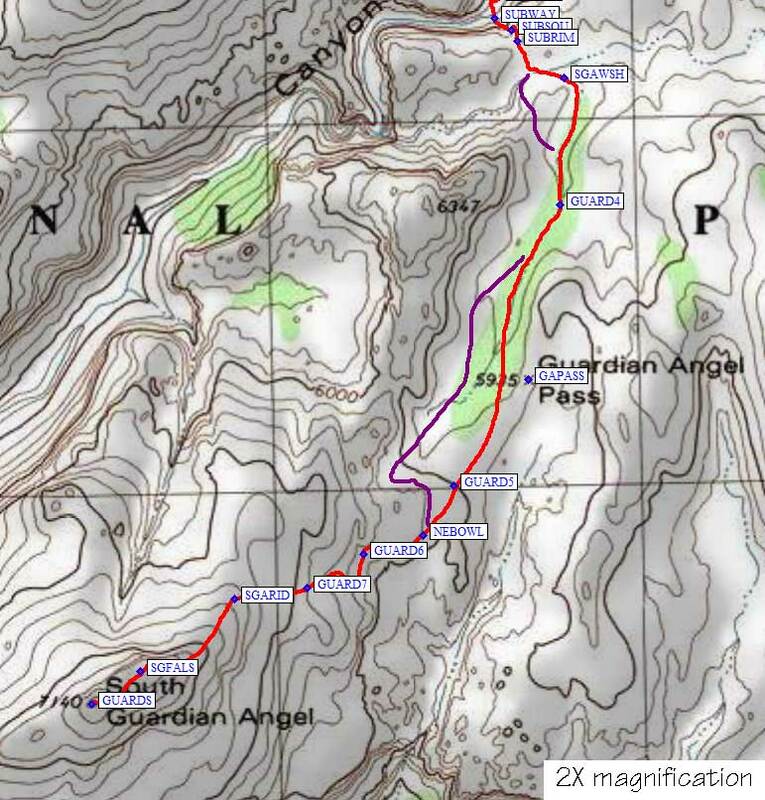 GPS waypoints shown in parentheses in the trip report correlate with the waypoints shown on the main map at the bottom of the report. SGA was up first because this was the longer day and was the Guardian Angel known for route-finding difficulties. If we somehow blew it today, we'd come back tomorrow and try again. 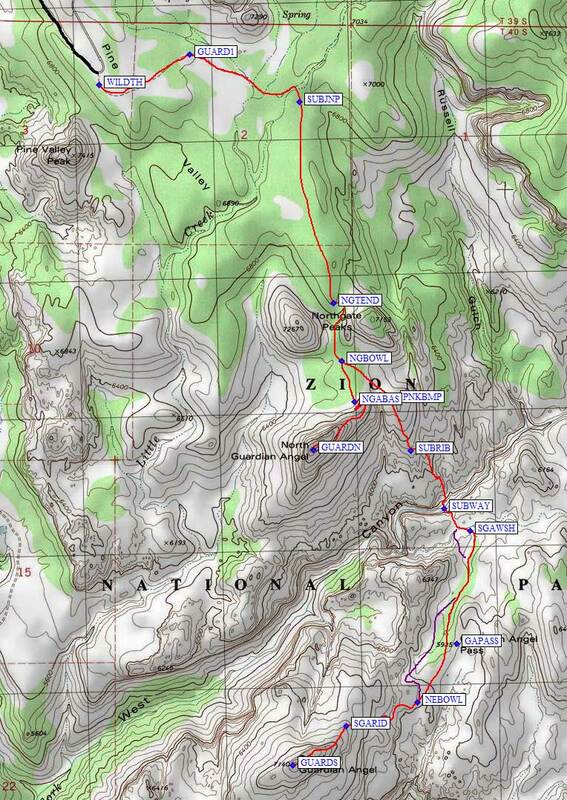 The day before this hike, John and I had discussed SGA routes with a Zion ranger in the Kolob Canyons Visitor Center. It was here that we were told a permit was not needed if you simply planned to cross the Subway, and not actually hike through it. This was exactly what our planned route would do. Wonderful! No permit necessary. 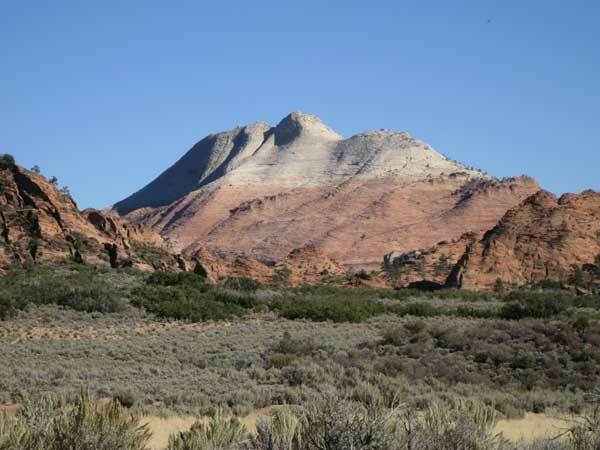 Our day began at the Wildcat Canyon trailhead (WILDTH) off of Kolob Reservoir Road, about 15.3 miles out of the town of Virgin. 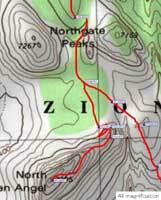 However, note that the Zion map given out at the entrance station calls this road Kolob Terrace Road. 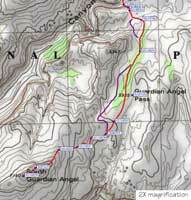 The trailhead is well-marked and is situated just below the conspicuous rocky knob known as Pine Valley Peak. No water available at the trailhead, but it has one the cleanest toilet facilities I've ever seen in a National Park. Starting the hike at 6:45 am, we walked a little less than a mile to the first trail junction and went straight, staying on the Wildcat Canyon Trail. The side trail off to our right had lots of rocks piled in it. Seems the Park does not want people walking this way anymore. Several hundred yards later we came to another trail junction and turned right onto the Northgate Peaks Trail. Yet a third junction appeared another hundred yards down the trail, with a trail sign indicating the Subway to the left (SUBJNP). Do not take the Subway trail! If your goal is SGA stay straight on the Northgate Peaks Trail. This is what the Ranger recommended, as this particular Subway trail is considerably more difficult and takes longer to negotiate. What's more, you would then need a permit to hike through the Subway. The official Northgate Peaks trail ends after slightly more than a mile at a volcanic outcropping with a nice view of North Guardian Angel (NGTEND). On either side of us were the Northgate Peaks. Our goal, SGA, was apparently behind NGA somewhere. 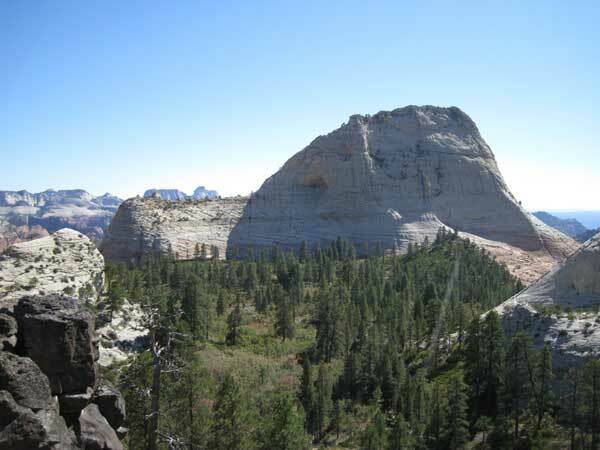 The hike to this rocky viewpoint was about 2.5 miles of relatively flat trail. We then dropped down off the left (east) side of the viewpoint rocks and followed a vague use trail down towards the East Northgate Peak. 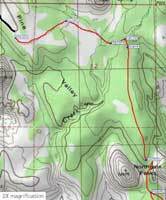 The use trail then continued towards NGA, but disappeared as the brush became thicker. Some light to moderate bushwhacking soon got us into a bowl (NGBOWL) where we then turned towards a low spot between the northeast shoulder of NGA and a pinkish-colored sandstone bump just a little farther north. The pinkish bump also may appear to be a banded mix of white and red sandstone, depending on the color of your mood I suppose. 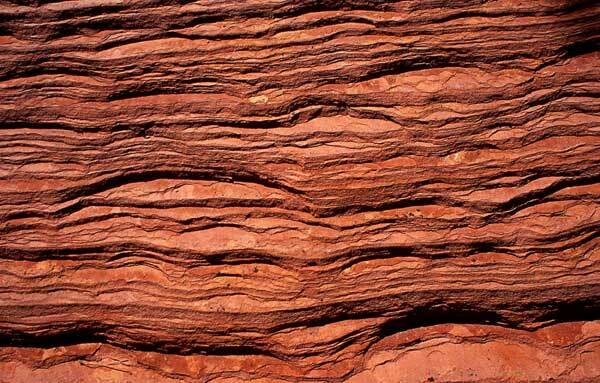 At the base of this sandstone bump (PNKBUMP) is where we now had to engage our route-finding skills. 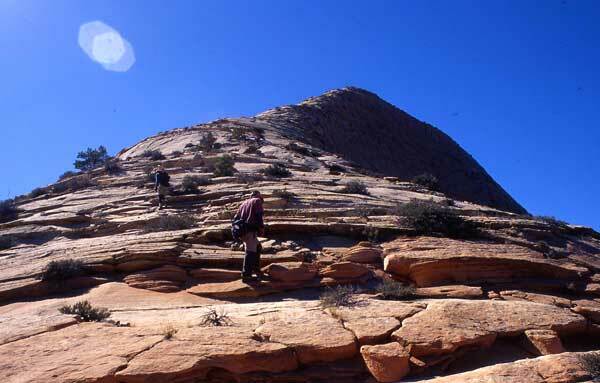 With a aid of past trip reports, including some advice from our friends Linda and Larry Emerson who had just been here, we then worked around the south side of the sandstone bump. It is not necessary to climb over the top of it. We then began to follow its ridge down into the Subway, staying slightly to the left side. Clearly, this was a major ridge leading down; no other ridge around us was nearly as big. By the time we dropped about two hundred feet, we began to run across the ducks other trip reports had mentioned. From here, we simply followed the ducks. The ducks were plentiful, but we occasionally had to stop and look around for the next pile of rocks. But it never took long to find the next duck. The ducks soon took a sharp left off of our main ridge over and around a small rib (SUBRIB), and then dropped us into a wide gully or bowl. The route continued down and east onto a much thinner inconspicuous ridge that was separate from the main ridge we had started down. The ducked path into the Subway now generally moved between the top of the thin inconspicuous ridge and the gully to our right (west). During our descent, we could look across and see a big vertical gash in the wall on the opposite side of the Subway. This steep gully, as it turned out, was going to be our ascent route out of the Subway. Nearing the bottom, we came to a 100 foot drop off to the creek in the Subway below. From here, we worked our way right into trees to a slot where we slid, plunge-stepped and slithered our way down steep sand, soil and vegetation to the bottom of the Subway (SUBWAY). The entire descent was rather fun if you don't mind a little bushwhacking here and there. The bottom of the Subway is an amazing place. Cool, dark and very narrow. The creek was barely more than a trickle and we could easily cross it without getting our feet wet. The famous rock formation called the jug handle was almost directly across from where we entered the Subway, slightly hidden behind some vegetation. The jug handle indicated the beginning of the gully or chute leading up and out the other side of the Subway. Just past the jug handle is the first real rock climbing of the trip. We encountered a 15 foot vertical rock wall in the gully that John judged to go about 5.4. John led the climb and then pulled out the rope for Steve and me. After watching Steve struggle on the rock with the awkward maneuvering required, I went back down to the jug handle and found that if you climb up a vertical crease of rock directly against the right side of the gully, you reach a ledge that takes you past the difficult rock wall pitch. It goes moderate-to-hard class 3. Re-reading past trip reports, it appears some climbers found this class 3 bypass while others went straight up the 5th class rock wall in the gully. In the Subway, Daryn and John looking through the jug handle at the beginning of the class 3 ledge. Photo by Steve Eckert. Further up, the gully widens a bit, but then turns slightly left where it narrows again. A short, easy class 3 move is found in this narrow section. We exited left out of the gully just after the class 3 section, and below where the gully becomes more difficult, following a faint use trail that was ducked further up. The trail zigzagged up the slope beside the gully and brought us up and out of the Subway. We then turned southeast and dropped briefly into a brushy area and climbed over a small ridge. On the other side of the ridge we dropped into a wash (SGAWSH), turned south, and began following it upstream. The wash branched several times over the next half mile and we tried to always take what looked like the larger branch. We ended up at the base of some colorful sandstone hoodoos. We went left around the hoodoo in front of us and had our first good view of SGA up close. 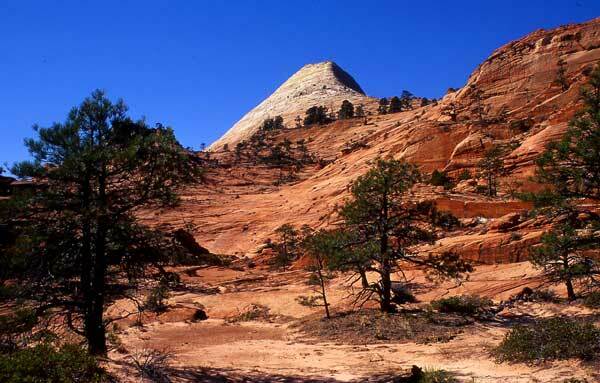 This area of Zion was composed of colorful red-and-white sandstone. Absolutely gorgeous! If it wasn't for the lack of water this would be an excellent area to camp. After a short break next to a small mushroomed-shaped rock, we side-hilled into a red sandstone bowl between us and the summit (NEBOWL). This proved to be the crux of the climb for me, as the rock where we entered the bowl was quite steep. After a little searching we were able to keep it class 3 and work our way onto lower angled rock higher up in the bowl. Finally at the base of SGA itself, we began a rather enjoyable 40-degree friction walk on white sandstone (SGARID). The only other part of the climb that got our attention was a 20 foot section of class 3/4 near the summit. We were able to pick our way up this steep section without pulling out the rope, but some climbers may want a rope here. We were not sure how one could protect this part of the climb, as there were no obvious solid anchors. On the ridge of South Guardian Angel. 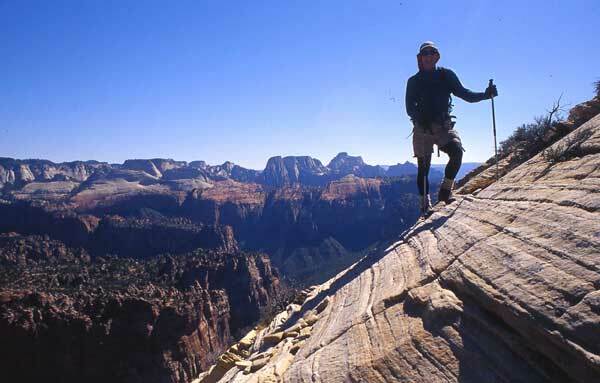 Steve and the view west into Zion National Park. Retracing our way back to the car was easier than expected. The rope never came out and we got down the last 100 feet into the Subway near the jug handle with little difficulty. The only tricky route-finding was trying to find where we begin our descent back down into the Subway from the south rim. It would have been helpful to remember this location on the way to SGA. We were back at the car 5:15 pm making the round trip hike about 11-12 miles in 10.5 hours. The challenging route-finding, the mysterious Subway, and beautiful sandstone rock made this one of my favorite hike/climbs on the DPS list. The DPS gives SGA a Class 4 rating. 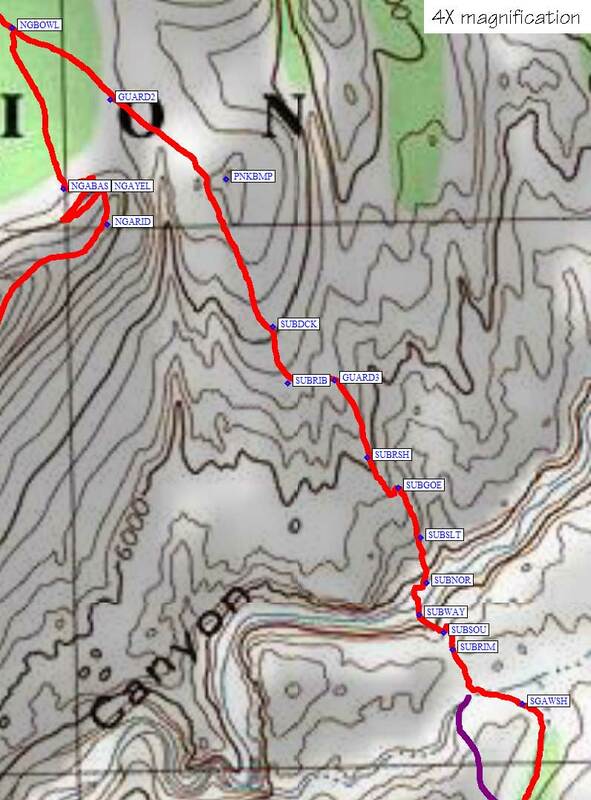 However, assuming you find the easiest route as we did, some climbers may consider this rating a bit generous. North Guardian Angel as viewed from the Northguard Peaks viewpoint. Photo by Steve Eckert. Feeling pretty good about getting SGA on the first try, we didn't get back out to the Wildcat Canyon trailhead and start hiking until 7:40 am. To get to the start of the climb, we retraced our steps from yesterday out to the rocky viewpoint where the trail ended, then dropped down into the bowl near NGA (NGBOWL). We worked our way through brush to the base of the NGA shoulder (NGABAS), briefly following a vague use trail just before we got there. I got my climbing shoes on and started up the steep friction. John had his cross-trainers on which also stuck well to the abrasive rock. 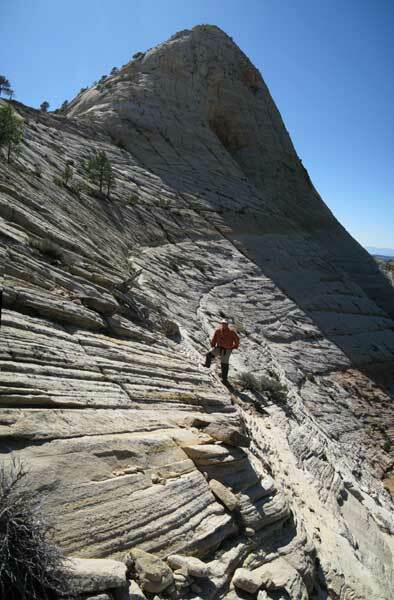 Steve had typical Vibram-soled hiking boots and noted that they didn't seem to stick as well to the sandstone. So we stuck together and went up a zig-zag pattern of ledges that took us almost to the top of the shoulder. The system of ledges turned out to be quite a fun little traverse. John on the zig-zagging ledge system on the shoulder of NGA. Photo by Steve Eckert. Walking SW along the top of the shoulder, we soon got to where the real climbing started and got on the harnesses. The entire route up goes pretty much as described in the DPS Guidebook with the first 50 feet of climbing the toughest part. The crack at the beginning of the climb that leads up and right towards a tree has a lay-back move part-way up. Although the DPS rates NGA as class 4, John considered this move a low 5. I led this part of the climb and belayed John and Steve up, using the tree as the belay station. The tree already had numerous slings around it. The route then went up and left from the tree, generally staying on the left side of the NGA ridge until near the summit. We eschewed using the rope as we climbed passed the tree growing next to a vertical rock slab, then passed the famous horizontal tree. However, the rope came out for the traverse left around an exposed rock rib as described in the Guidebook; a short class 4 move at elev. 6960 ft. We used one or two of the chocks and cams we brought along and placed them in nearby cracks for an anchor. Above this pitch we stayed left of a cliff band, but eventually worked our way onto the top of the ridge. It was now an easy hike on sand and rock to the summit. On top the views were even better than on SGA because of NGA's higher altitude. We could hear occasional whoops and hollers of people deep down in the Subway far below us. Sections of the Subway apparently make a great echo chamber. Coming down, we used the rope to rap or belay the two sections we protected coming up. In addition, we rapped down a 25 meter class 3/4 section above the horizontal tree. John rapping down the crux onto the shoulder of NGA. Photo by Steve Eckert. Round trip stats were 6 miles and 7 hrs. Equipment we brought included an assortment of 4 chocks or cams, three slings, and a 50 meter rope.